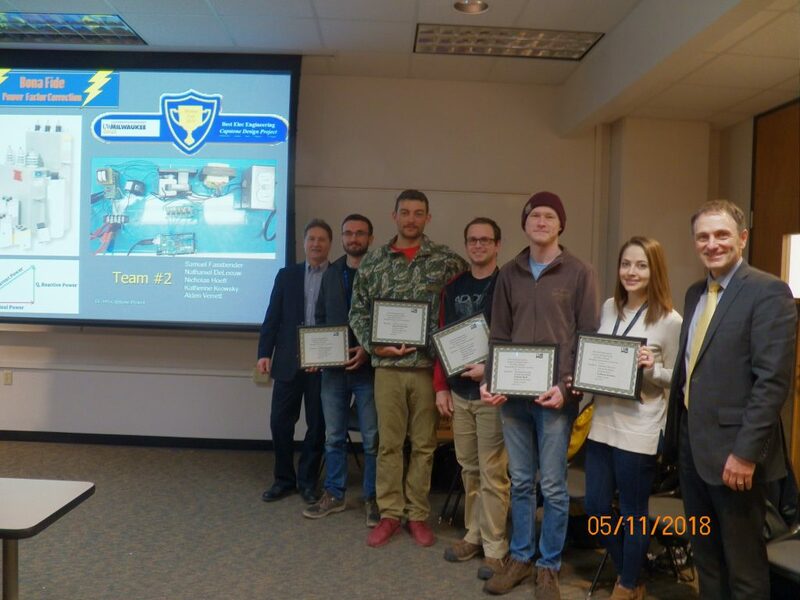 Congratulations to the Best EE Capstone Design team in Fall 2017 for their project titled Bonafide Power Factor Correction. Dean Peters presented awards to the team members along with EE595 course instructor, Adjunct Assistant Prof. Jeff Kautzer on May 11th, 2018. Picture shows in the order from the left to the right Adjunct Assistant Prof. Jeff Kautzer, team members (Nathaniel DeLeeuwm, Samuel Fassbender, Alden Verret, Nicholas Hoeft Katherine Krowsky) and Dean Peters.